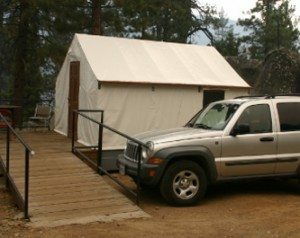 The new upgraded tent cabins consist of a large heavy duty canvass roof and walls set upon a sturdy raised wooden platform with a standard wood door and screened windows. Community restrooms with flush toilets and hot water sinks are nearby. 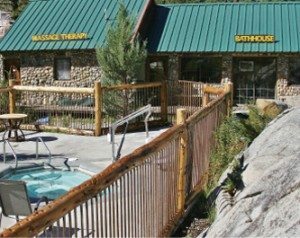 Showers/baths are provided at the Resort Hot Springs Bathhouse free of charge. Outside cooking and campfires are allowed using an outside stone campfire ring and grill with a large picnic table and chairs. You must bring your own bedding (sheets, blankets, pillows, towels, or sleeping bag) and cooking equipment (camp stove, ice chest, cooking utensils, plates, silverware, lantern, etc…) Bear boxes are provided. Pets are welcome but must be on a leash when outside. Use of Resort Hot Springs Bathhouse/Spa is included with all Tent and Camping Cabins. 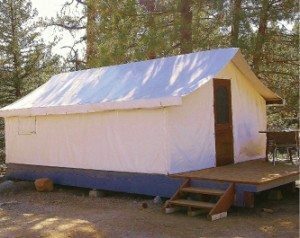 The one room wood siding camping cabins offers comfort for those that enjoy roughing it a little. For outdoor cooking, there is a stone ringed outdoor fire pit with a grill and large picnic table. Cooking utensils, plates and silverware for outdoor cooking are furnished but bring your own camp stove and ice chest. Community restrooms with flush toilets and hot water sinks are nearby. There are no inside heaters. Bedding is provided for all three beds along with bath and hand towels for 4 people. Pets are welcome but must be on a leash at all times when outside. Minimum Stay: Three night minimum stay during July and August. Weekend stays are ok before July 1st and after Labor Day Weekend. Shorter stays may be ok depending on availability. Discount: 10% off for weekly stays. Please call for more information at (559) 325 1710. Deposit: A $350 deposit per week or the full amount is required if less than $350. We accept Visa, MasterCard and Discover. Pet Policy and fees: We are dog friendly; however, barkers and dogs that may bite for any reason are not allowed. Pets are not permitted in the cafe, store, or on the bathhouse and spa area. Assistance dogs are exempt. Guest must pick up their dogs business with plastic bags and dispose in trash containers. All dogs must be on a leash at all times when outside the cabin; pets are not allowed on beds, futons etc. Pet fee is $12 per day per pet with a 2 dog limit. Additional fees will be assessed for any pet damages or excessive cleaning incurred. Electronic Music: In keeping with the serene Wilderness atmosphere, no electronic devices are allowed to be played on resort property except inside cabins at a level that will not disturb other guests. Extra People: An additional fee of $12 per person will be charged over the recommended capacity. Check in/Out time: Check out time is before 10:30 AM. Check in time is after 3:00 PM. 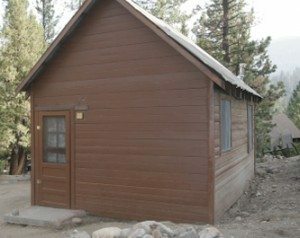 Cabins are held open one day (until 2 PM) after intended arrival. Cancellations: If a cabin cancellation is at least 14 days prior to the arrival date, 50% of your deposit will be refunded. Cancellations made less than 14 days, but before 24 hours of the arrival date, will receive a credit certificate of 25% of the deposit for another cabin reservation. Reservations made a calendar year in advance may be subject to a price increase. Regarding late arrivals or early departures, guests are responsible for the full number of days reserved and, we cannot be responsible for acts of nature, emergencies, illness, personal injuries or any other situations not under our control that prevent you from using your reservation. Other Information: USDA + FTSC 9.75% Charge for all cabins. Cabin rates may be subject to changes based on availability. Absolutely no tents are allowed on resort property. All cabins are designated non-smoking cabins. Season: The usual season is from May 15th to November 1st. The resort may open sooner or later depending upon winter snowfall and melt-off. Please Call (559) 325-1710 anytime for reservations.